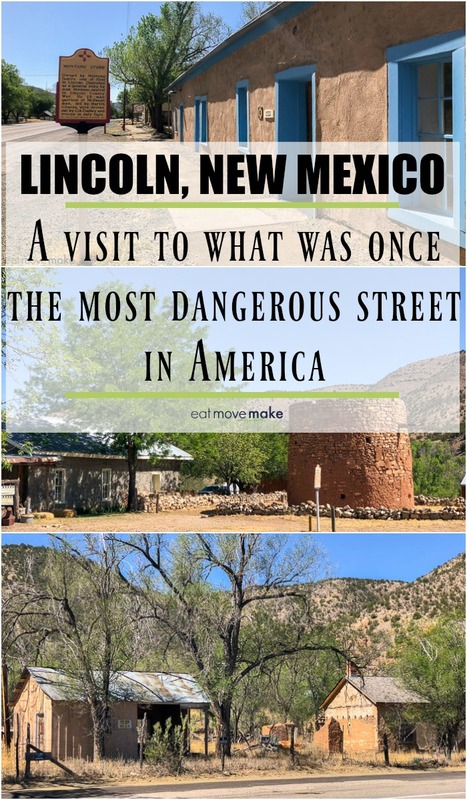 Lincoln, New Mexico was one of the most violently criminal towns in the Wild Wild West, and its main street was dubbed “the most dangerous street in America” by President Rutherford B. Hayes. While many Old West towns have sinister legends, the truth is that they weren’t really any more perilous than any other town. Lincoln, New Mexico however, was different; it was aggressively violent. And when you visit Lincoln today, you’ll see it exactly as it looked in the late 1800’s. 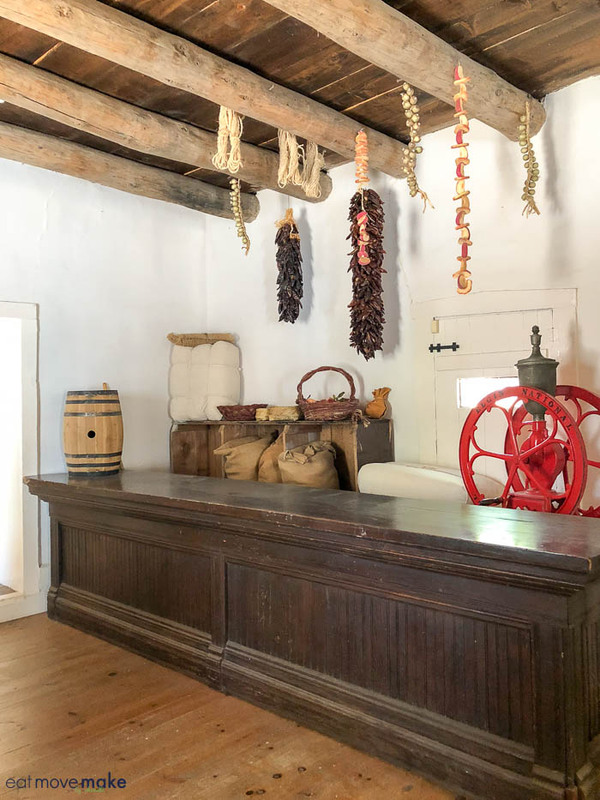 It’s the most well-preserved Western town in the U.S., and visitors can walk down Main Street in the footsteps of the infamous Billy the Kid and Sheriff Pat Garrett fort a taste of what life was like back in the days of gunfights and lawlessness. 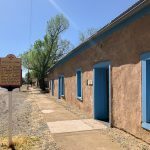 The entire town is a National Historic Landmark and State Monument and a visit to Lincoln gives a fascinating look into one of the greatest legends of the Wild Wild West – Billy the Kid. The ideal place to start your exploration is at the Visitor Center, the central museum of the entire historic site. Take your time exploring the exhibits and be sure to catch the 22-minute film on Lincoln’s history. There are 17 structures to explore in Lincoln, some of which are open year-round and others just seasonally. 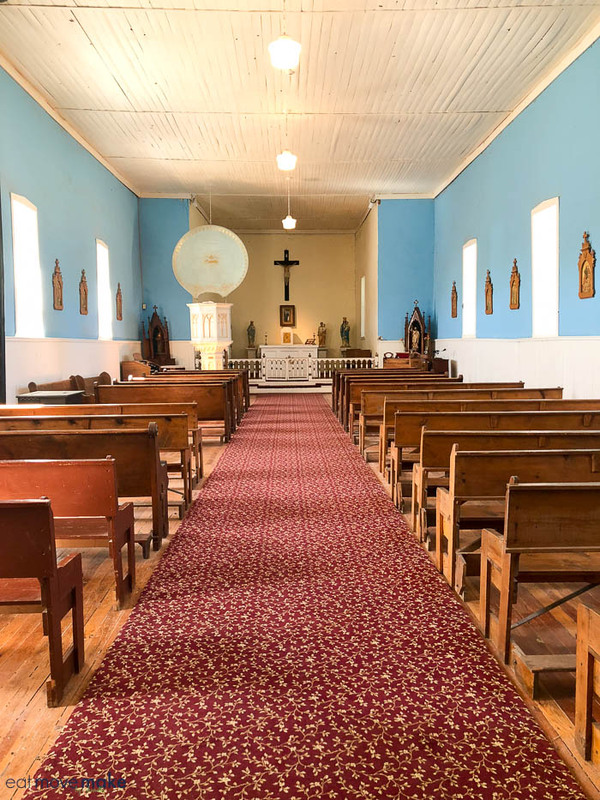 Although I couldn’t visit them all due to time constraints, I visited as many as I could and got a true sense of the power struggle that led to the Lincoln County War. Historical signs point out key locations, but if you can arrange for a guided tour, I highly recommend it. 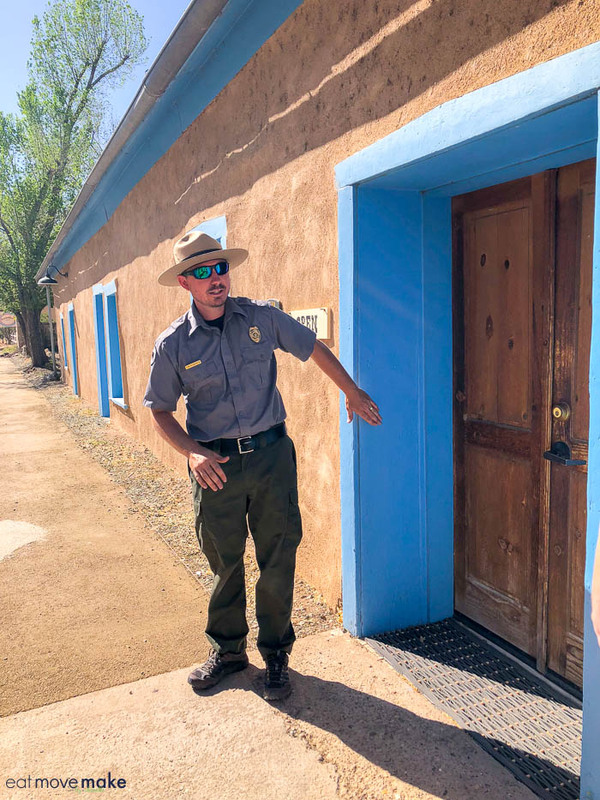 Our ranger truly brought Lincoln’s history to life for us through his stories. It started with greed and culminated with the bloodiest five-day gunfight battle in all of the Wild, Wild West. Feuding began between Alexander McSween and Lawrence Murphy over business concerns. Murphy had a stranglehold on his customers and exploited it to a nefarious degree. 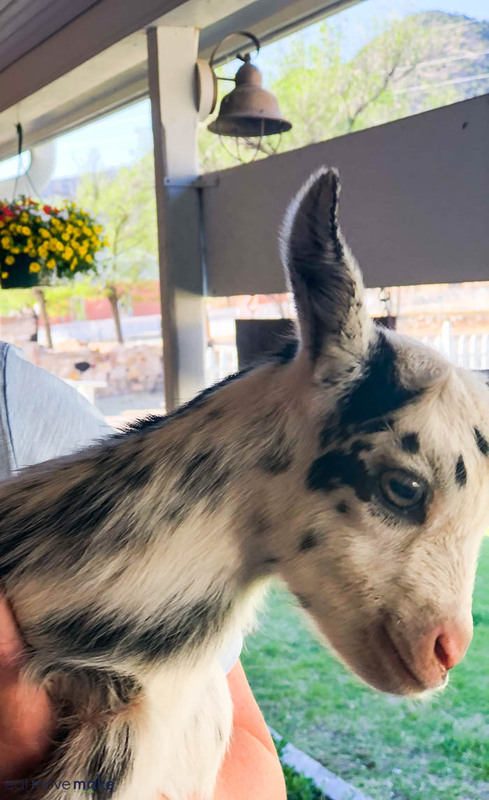 McSween, a lawyer, wanted to level the playing field, create opportunity and get some control for his client, John Tunstall, who also had a Lincoln County mercantile and ranching business. As the conflict grew, the opposing factions hired gangs to intimidate, harass and enforce their respective interests. 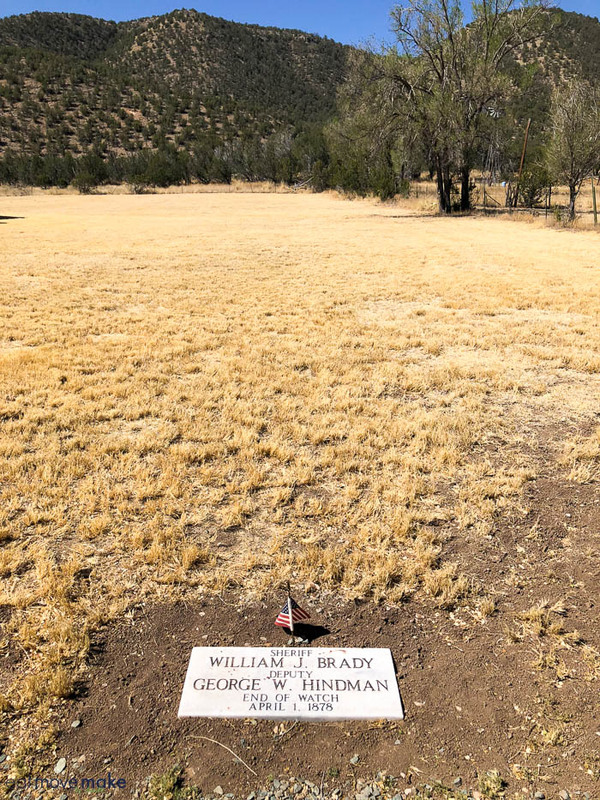 The Murphy-Dolan faction hired the “Jesse Evans Gang” and the McSween-Tunstall-Chisum faction hired “The Regulators”, one of whom was William H. Bonney aka Billy the Kid – the outlaw legend for whom the Lincoln County War is so well known. When John Tunstall was murdered by Murphy’s gang, the Regulators, several of whom had seen it happen went after the killers. Billy the Kid shot two deputies dead and a warrant was issued for his arrest. Back in Lincoln at the Tunstall store for supplies, they spotted William Brady and four deputies coming down the street. Still enraged over Tunstall’s death, the Regulators ran to the corral and opened fire. Brady was shot 12 times. The conflict and killing continued for months on end with the crescendo being a brutal and bloody five-day gunfight battle. With a bounty on his head for the death of Sheriff Brady, Billy the Kid and the remaining Regulators fled the county. Lincoln was still a place of lawlessness, so a new sheriff was elected to straighten things out and hunt down outlaws, including Billy the Kid. His name was Pat Garrett. Garrett’s posse eventually found and captured Billy the Kid in a place called “Stinking Springs”. Billy stood trial for the murder of Sheriff Brady (and was, in fact, the only participant in the Lincoln County War to be tried for a capital crime). 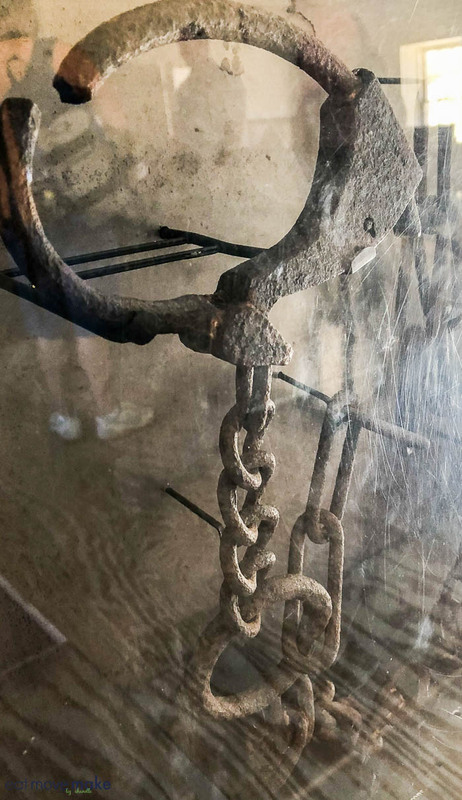 He was sentenced to death by hanging and brought back to Lincoln’s courthouse jail. And from there, Billy the Kid made his infamous escape shooting two deputies in the process. On the way back from a trip to the privy, he overtook Deputy Bell, shooting him at the top of this staircase. It’s believed Billy hit Deputy Bell over the head with his manacles, took his gun and shot him. 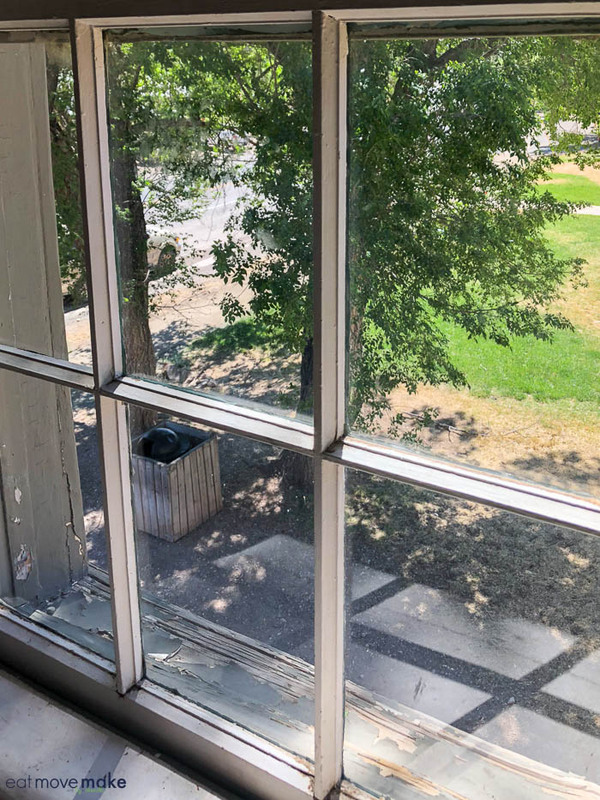 He waited with a rifle at this window as Deputy Bill Ollinger, hearing gunshots, rushed back across the street from the Wortley Hotel, and he shot him dead before escaping to Fort Sumner. 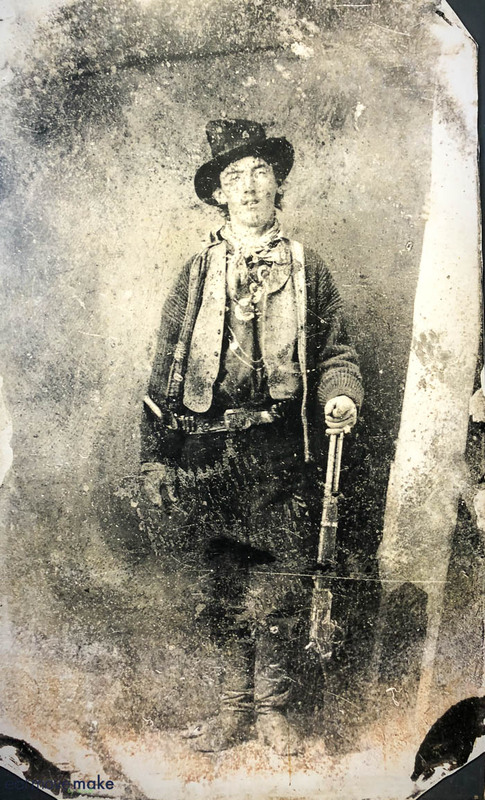 And now we know William H. Bonney aka Billy the Kid as one of the most notorious outlaws in Wild West history. Ranger Tip: For the closest movie rendition of what really happened in Lincoln New Mexico, watch Young Guns. Believe it or not! 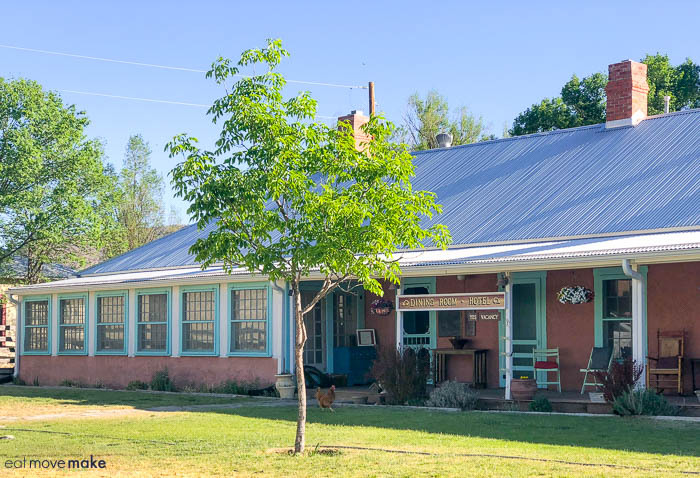 This adobe building was operated by one of the first families in Lincoln and was a general store, saloon and boarding house. 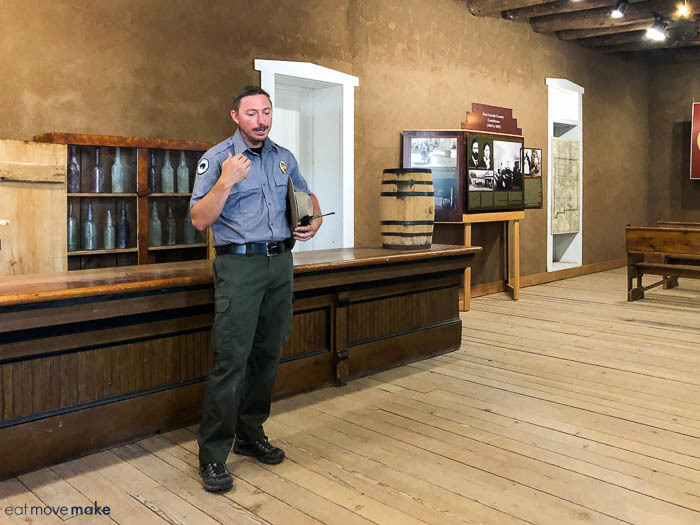 The ranger explains how the warring business factions led to the Lincoln County War. 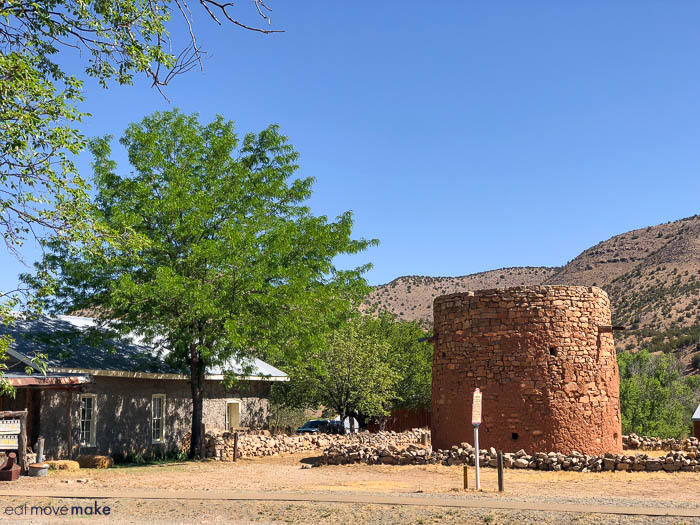 Torreons were common in territorial New Mexico, and this tower built for mutual defense was probably the first thing built in town. With its eight-to-ten-foot high walls, it was a safe place to protect livestock from theft too. 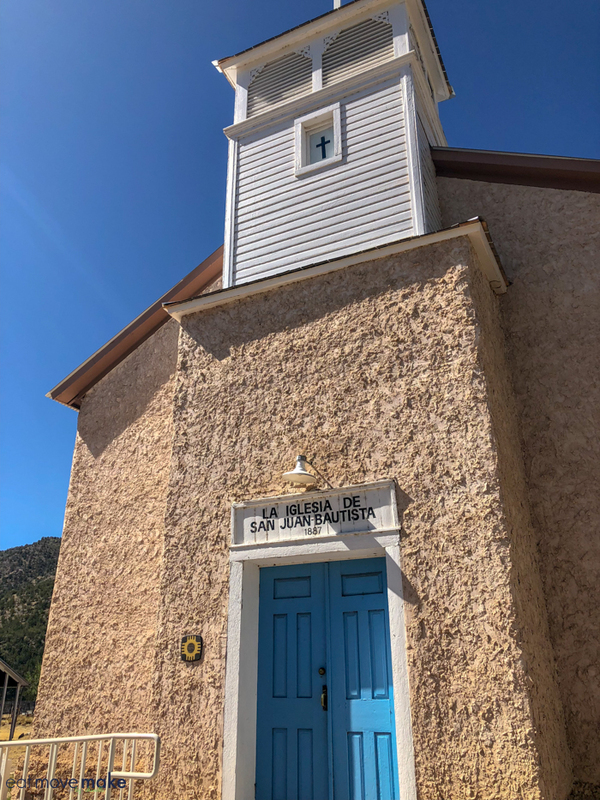 The San Juan Mission church was constructed of adobe and vigas and was built by the congregation in 1887. It still holds services today. 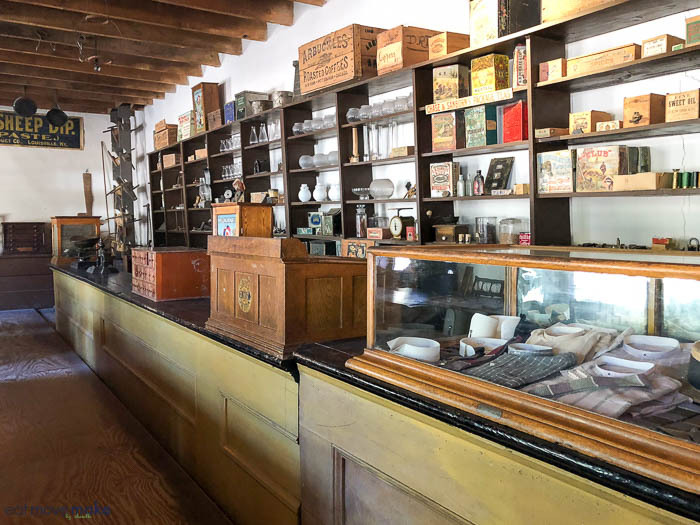 The Tunstall General Store still displays original merchandise in the original display cases, but it also operates as a post office today. 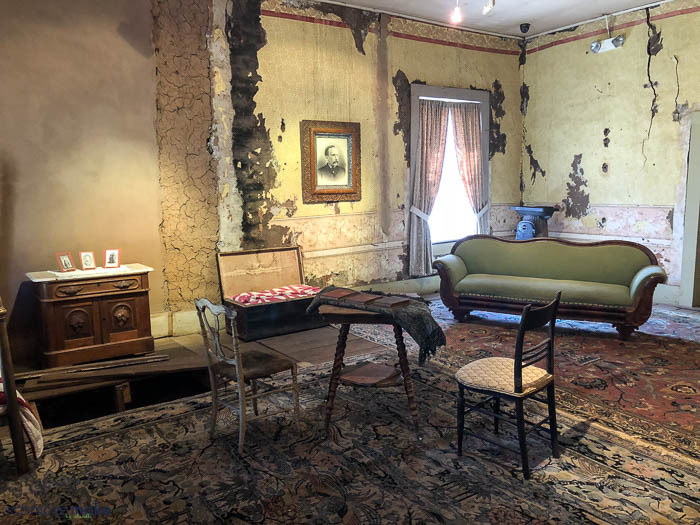 Make sure to peek into John Tunstall’s living quarters at the secret floorboard hideout. Actual unopened merchandise from the Tunstall store time period. 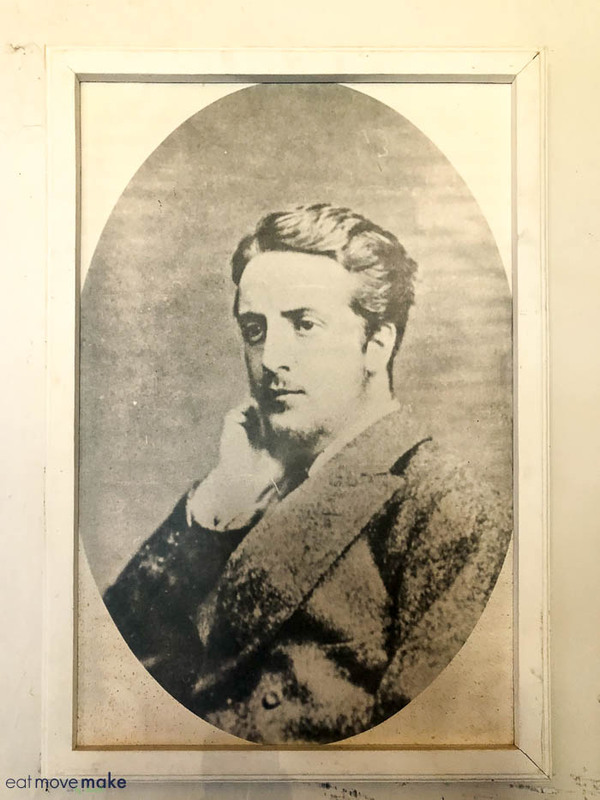 John Tunstall, whose murder spurred the beginning of the Lincoln County War. 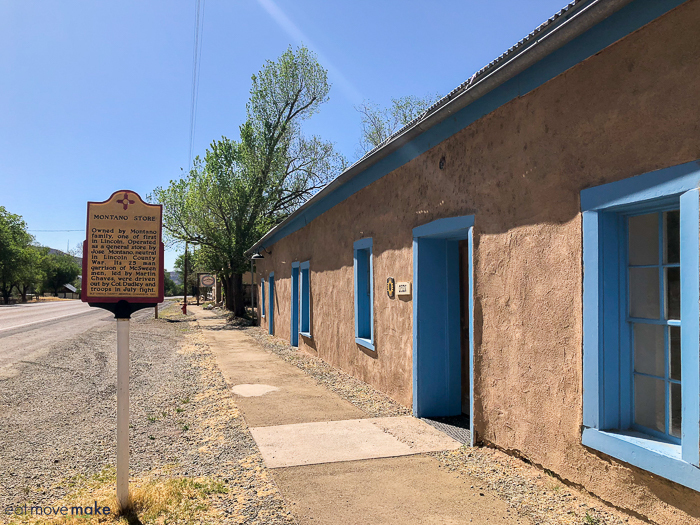 The floorboard hideout in the living quarters behind the Tunstall store is rumored to have hidden Billy the Kid, but it’s likely that it was Jim French who was shot and took cover here. 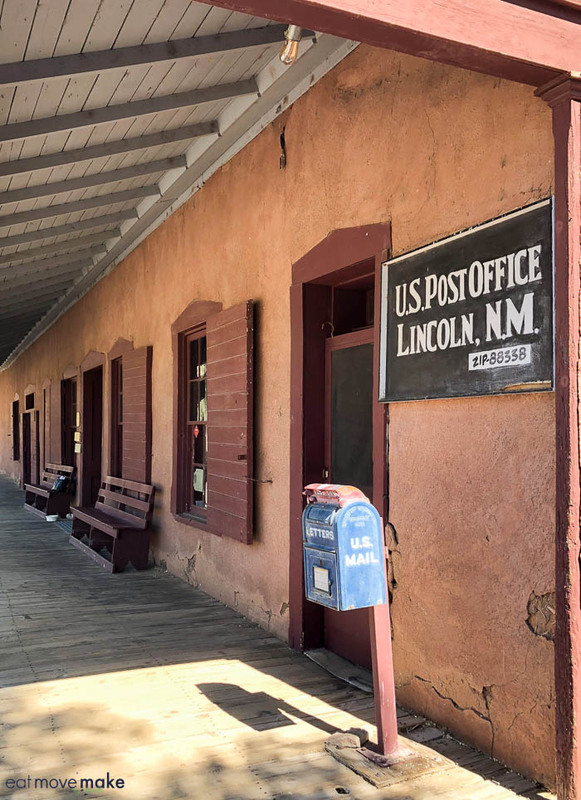 Pin this Lincoln New Mexico post! 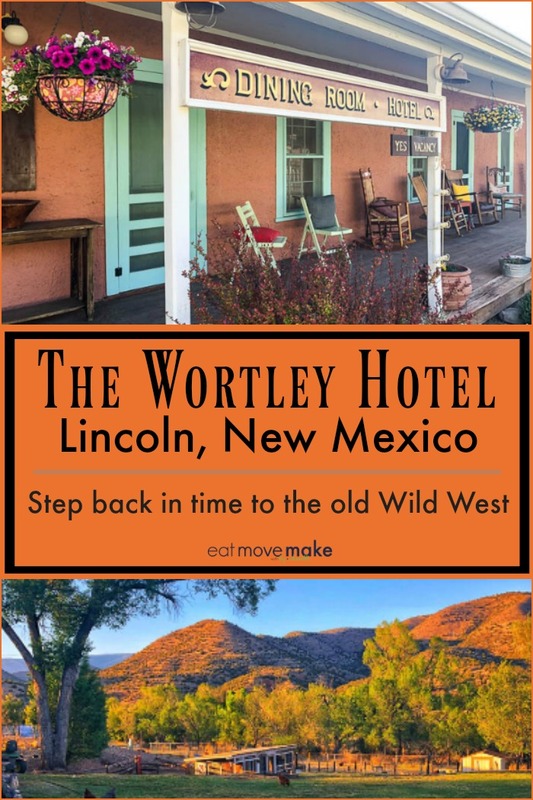 Lucky guests of the historic Wortley Hotel in Lincoln, New Mexico will find themselves in the center of a Wild West time capsule. 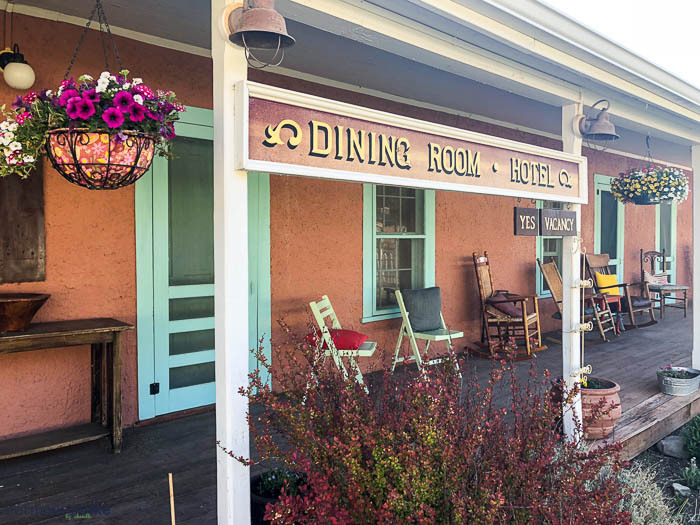 The hotel, formerly owned by Sheriff Pat Garrett who shot the infamous Billy the Kid, sits on what was once the most dangerous street in America. 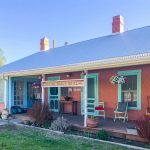 Of course, the Wild West lawlessness is long gone these days; guests will find nothing but peace and relaxation in this blissful New Mexico mountain town bed and breakfast. 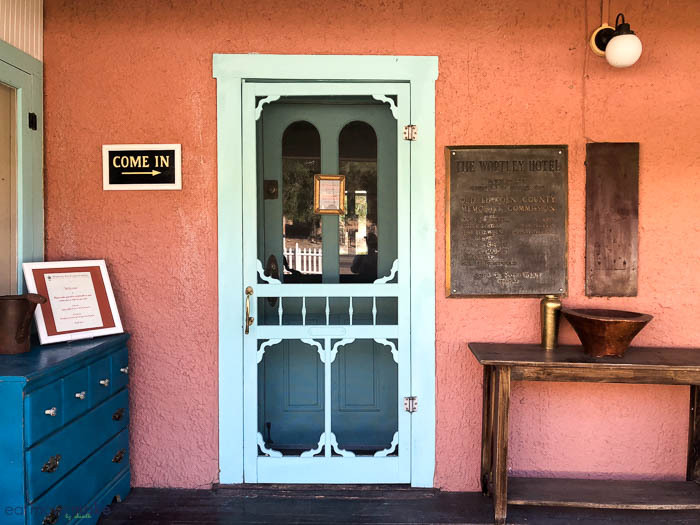 I stayed at the Wortley Hotel as part of a Southern New Mexico press trip. The Wortley Hotel, along with the entire town of Lincoln is on the National Register of Historic Places, so the exterior of the building looks just as it did way back when. 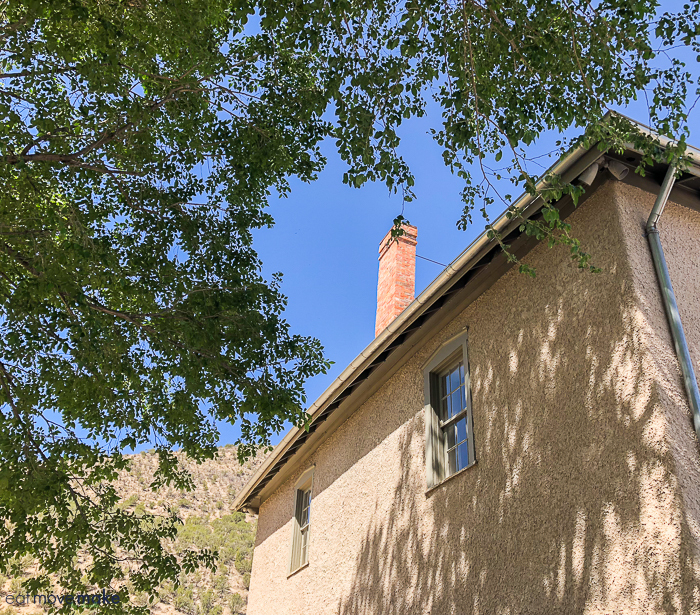 Sitting on the front porch, guests can look out at the Lincoln jail which held Billy the Kid before he made his notorious escape. 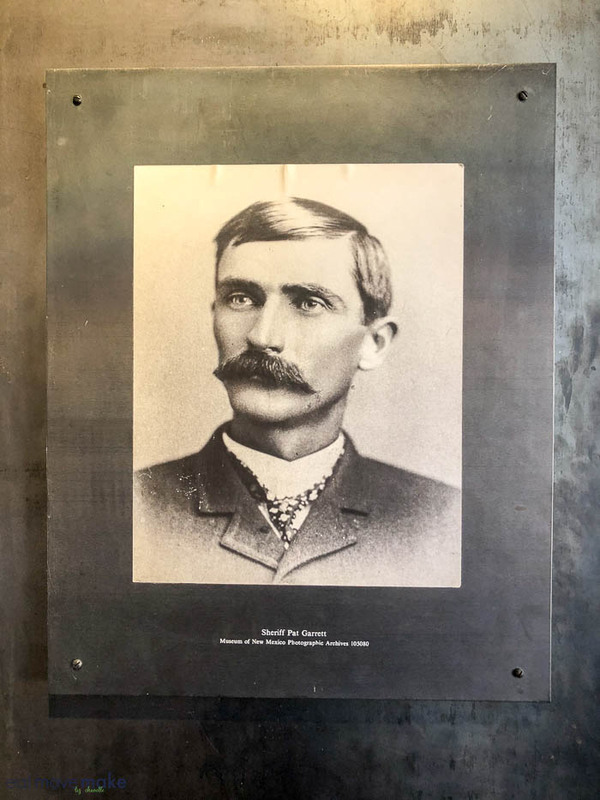 In fact, Deputy Marshall Bob Olinger was having a meal at the Wortley when he heard the gunshots that killed Deputy Jim Bell during Billy the Kid’s famous jailbreak. When he ran across the street to the jail, Billy shot and killed him too. Imagine staying in the middle of where all this happened! 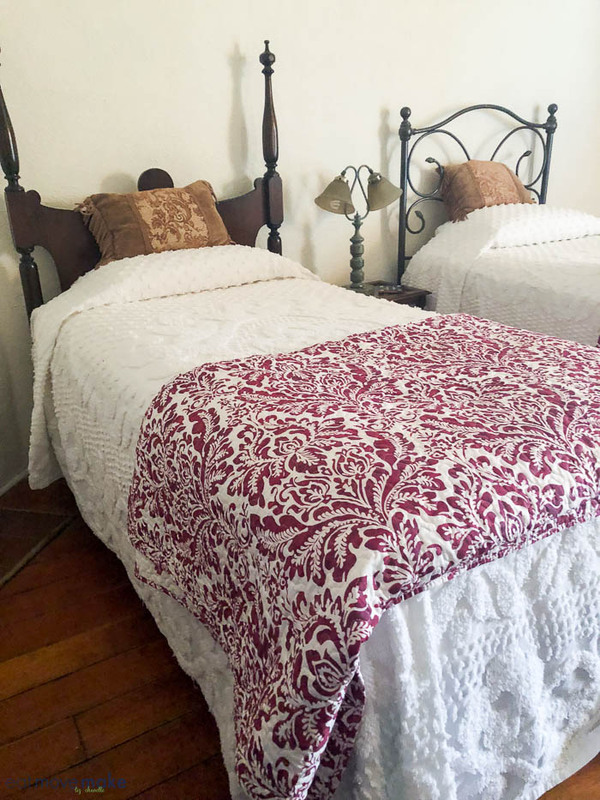 There are five period-style rooms available for booking at the Wortley Hotel, each with a private entrance, small bathroom and working fireplace. 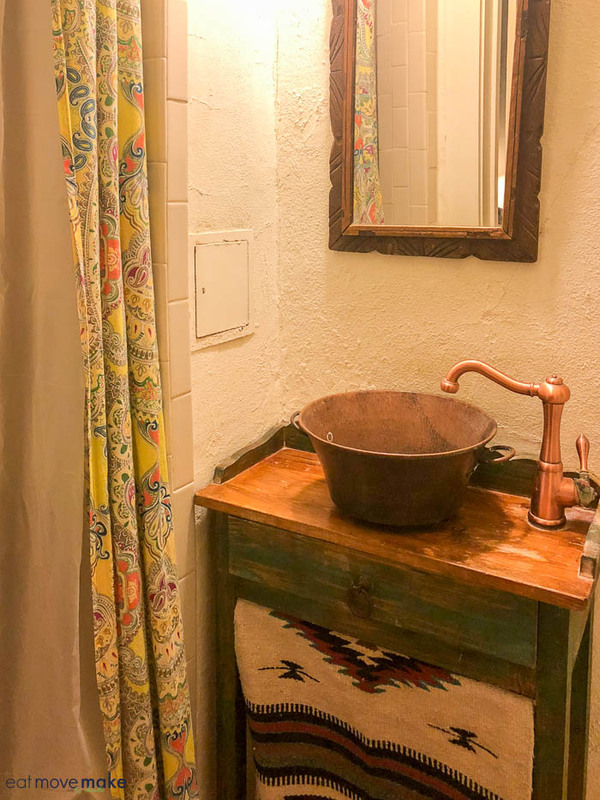 Most of the rooms have queen beds, but mine had two cozy twin beds and a bathroom with a shower. 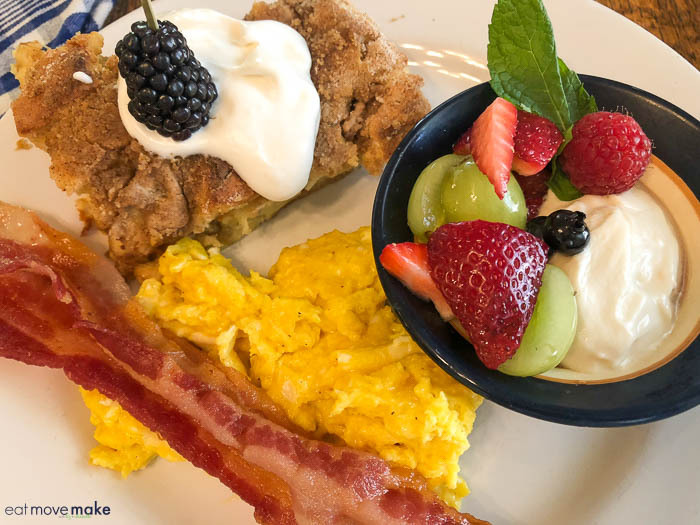 Each stay comes with a home cooked breakfast, and if you need coffee before breakfast is served, you’ll find a fresh pot out on the front porch waiting for you. 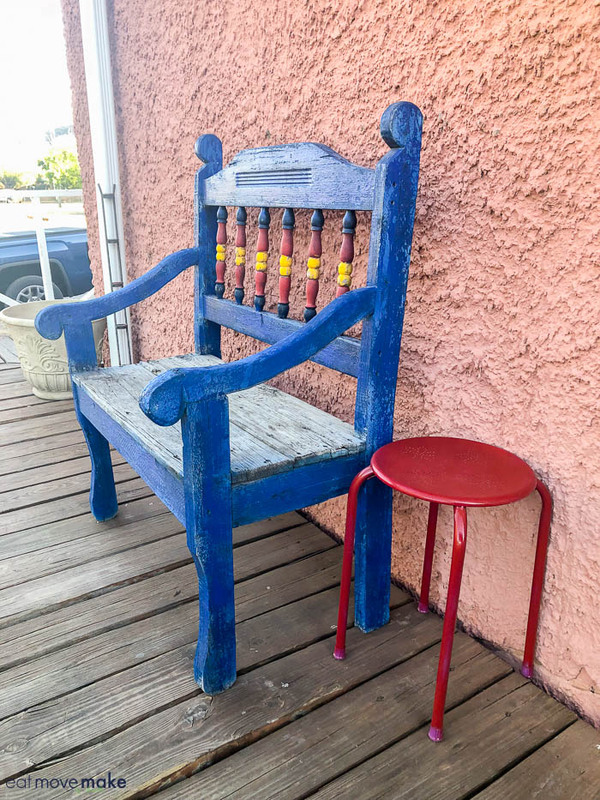 Relax on a porch rocker in the evening and you’ll probably see deer and elk wandering by to say hello. 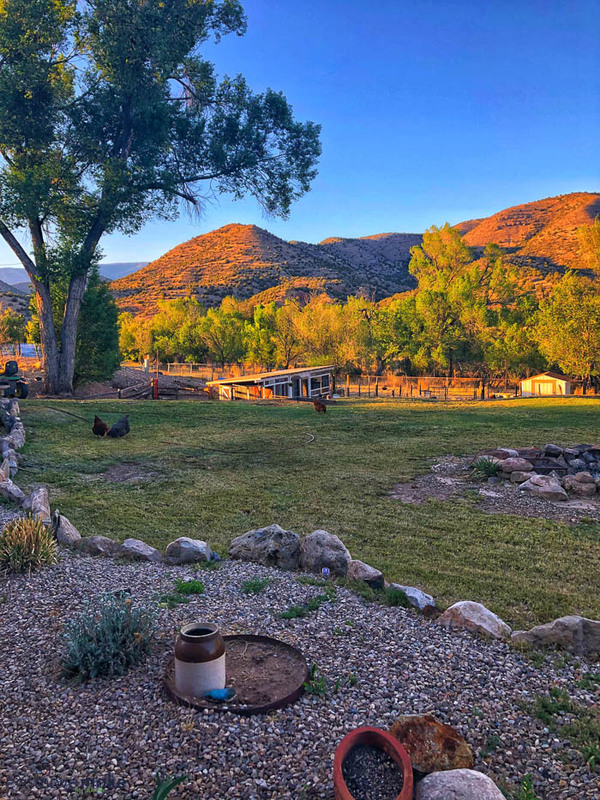 In the daytime, you’ll be greeted by some of the free-range hens roaming the property. 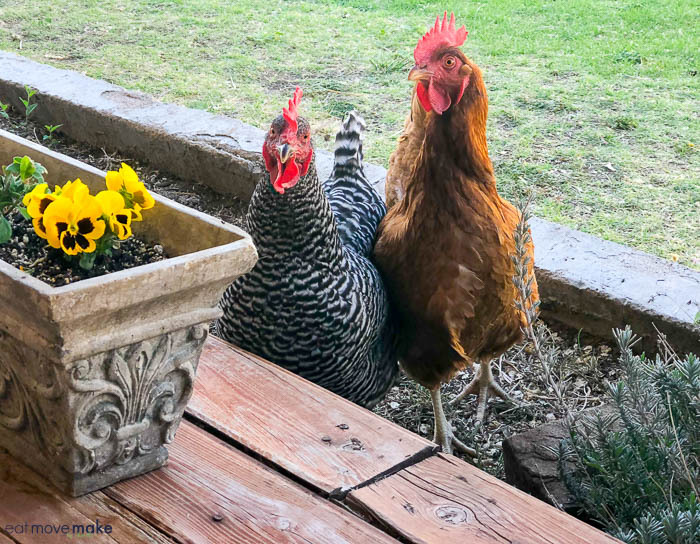 Perhaps they’re checking to see if you enjoyed their fresh eggs that morning for breakfast? By the way, meals at the Wortley Hotel are thoroughly modern and oh, so delicious! 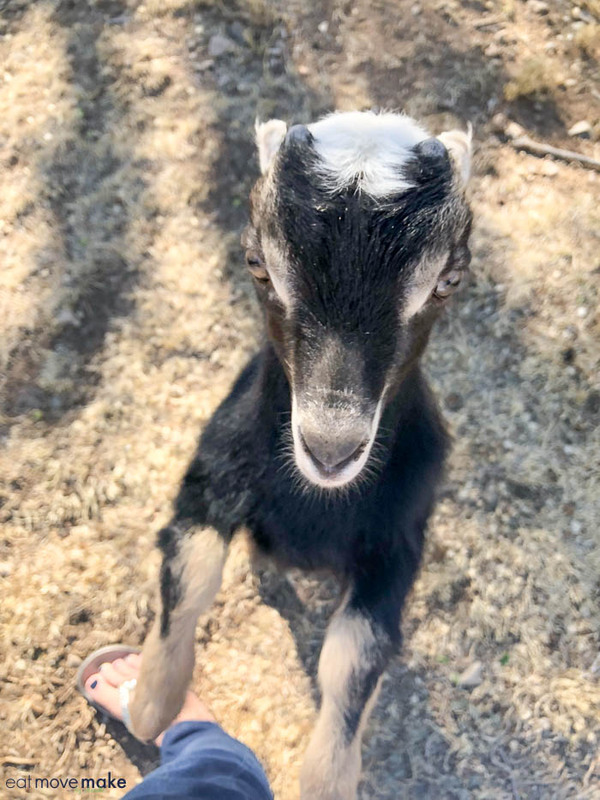 But about those animals… you can also see goats, pigs and sheep at the mini-farm out back, and if you’re lucky enough to be there when there are baby goats, you’re in for lots of cuddles! Also out back, you’ll be able to see the Rio Bonito river basin and of course, those rolling hills and mountains. The sunsets are spectacular here too! 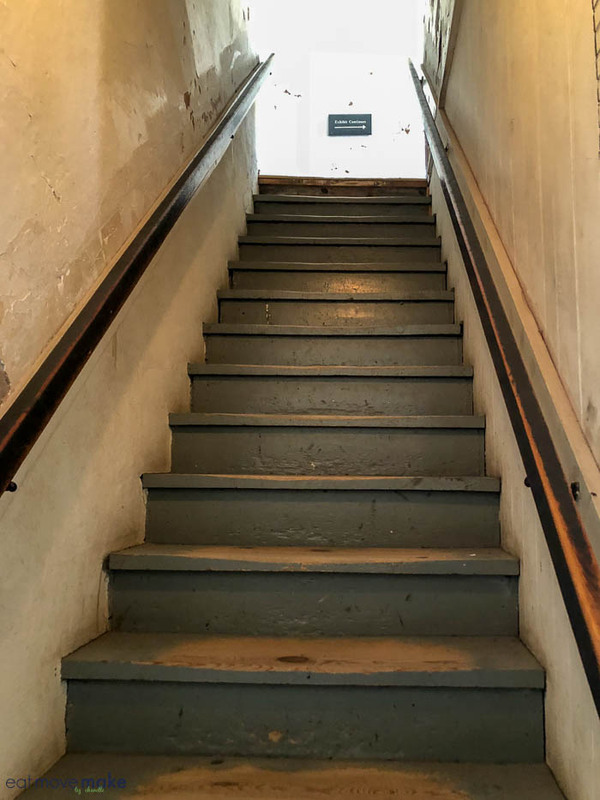 While you’re staying at the Wortley Hotel, be sure to stroll through Lincoln Historic Site and better yet, arrange for a tour. I loved hearing the Wild West tales of the Lincoln County War. If you’re fascinated with outlaws, Pat Garrett and Billy the Kid, it’s not be missed! Pin this for travel inspo! Click here for more info and to book a stay at the Wortley Hotel. 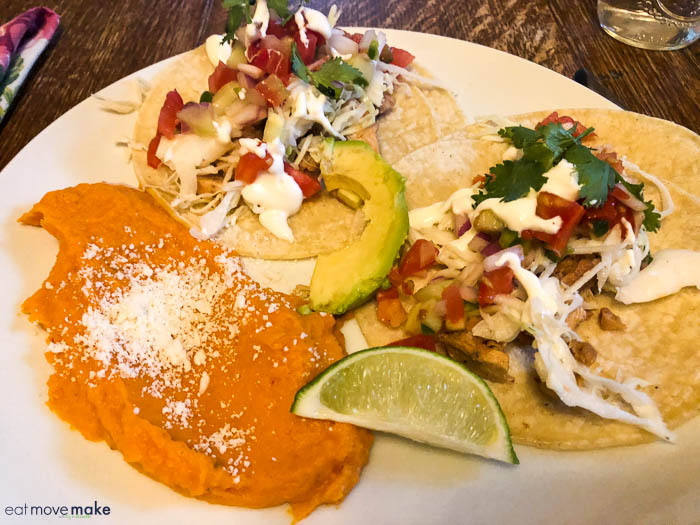 I promise you it’ll make a #NewMexicoTrue memory you’ll never forget.